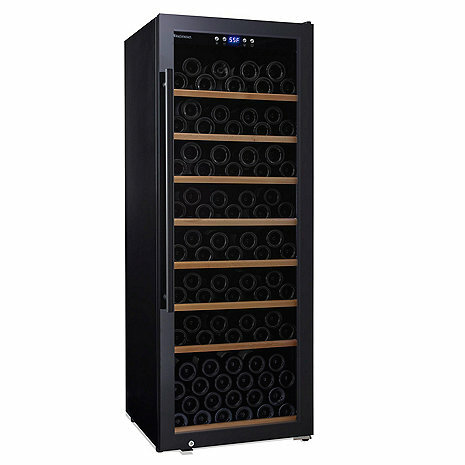 Whether you’re looking for a starter cellar or really dependable storage, our Classic Black is the economical solution! The 150 bottle single zone, free standing cabinet is highly effective, protecting your investments with high quality wine storage technology. This is perfect wine cellar to have in the pantry, basement or family room. • Single Zone, Free Standing. This unit features an adjustable thermostat that can be set 41° F to 68° F; a temperature range of 46-66°F provides ideal storing conditions for reds and whites, and optimum serving conditions for most whites. Features triple pane glass door with UV protection, black full glass exterior door and black cabinet, complete with cool blue LED lighting. Black wire shelving with attractive wood trim gently cradles your favorites, making it easy to view your entire collection. The wine cellar will hold up to 150 ‘standard’ Bordeaux sized bottles, as shown below. If up to half of your collection consists of non-standard Bordeaux-size bottles, your maximum capacity may be reduced by 20-25%. If your collection consists mostly of these larger sized bottles, your maximum capacity may be reduced by as much as 40%. Does it have a left hinge option? who is the manufacturer? What is the model number? Does this have a security lock on the door? BEST ANSWER: Jennifer, Yes there is a lock at the bottom left hand corner of this unit. Yes - you can see the lock on the lower left hand side of the door. Jennifer, yes it does have a key lock in the lower left corner. Yes on the bottom of the door. We have never used it though. Yes. The shelving is not perfect. can the light be turned on and off? BEST ANSWER: Yes: We purchased the Classic L-150 in February 2018. They delived to our garage, set it up and its been working great. No problems. yes, there is a button that acts as a light switch. Yes. With a button on the top. Can a unit like this be kept in the garage for wine storage? BEST ANSWER: Simple answer. It depends on the manufacturers range of service temperatures and the range from low to high that your garage will see. Make sure your garage does not go above or below the recommended service temperatures. It can, but extreme temps in the garage could effect its performance at keeping temps correct. It can but depending on the heat you have it may end up running continually. Can the cooling unit be removed for easier movement, then reinstalled? Can additional shelves be purchased and added to the unit? BEST ANSWER: no. IMHO additional shelves would mitigate capacity. Is this unit powered by compressor? I don't see it in the specifications. Finally broke down and bought this wine cellar. Happy with the purchase and delivery was fabulous. Arrived on time and it's exactly as expected. Love how quiet it is! I like the fact that you can turn off/on the interior light-nice feature. I've been told you can store white and red together and optimal temp is 55degrees-so that's what I'm doing. I'm no wine expert so ymmv. Decided in the end with that advice I would save the money and ditch the dual zone option. Seems to be holding a very consistent temperature. We like it very much! A suggestion - can you develop a better way of tracking the unit while in transit? No way to plan for delivery. Support people are great. Great celllar for the price. We just received our new cellar this week. The white glove delivery service was the best we have ever experienced. Great communication, friendly and knowledgeable delivery team and arrived on time. It is much quieter than we expected from experience with our previous cellar. Delivered exactly as described, Very happy with this unit. This unit is the perfect size to fit in the corner of my dining room. It looks very nice. I like the blue display light you can turn off or on. The lock on it was a must for us. Easy to use. Fairly quiet for a fridge of it's size. About the same noise level as our regular fridge, if not slightly less loud. Keeps at a constant and accurate temp. The white glove delivery guys gave attitude about slightly moving the unit for my pregnant wife, but they ended up doing it. They also did not give the heads up call that they were about to arrive,as had been promised. But as for the unit, no issues. Highly recommend. The delivery went went without a hitch. The cooler looks nice and the family like the blue lights. It cools well and do not make much noise. The only negative is that it makes a rather loud rattling sound whenever the compressor turns off. Overall, a good wine cooler. Always looked at the wine cellars with a strong sense of yearning - but alas the prices were just a bit out of reach. When I saw this one listed just a couple hundred dollars north of a grand I took the plunge. Delivery was outstanding. much quicker than expected. Excellent service. Notified when they were on the way - could not have been better. After plugging it in and loading it up with about 50 bottles the Cellar reached the desired 55 degrees pretty quickly. So far its working to perfection. I would give it a 5 star rating but two of my shelving units just didn't snap into place the way they should have. One shelf I was finally able to snap into place - the other is "kinda" in place - I have to be careful when I pull that shelf out. Overall I am extremely please and felt like I got a great buy. We purchased the Classic L-150 Wine Cellar for our new home. It was easy to level and start up. Cools down quickly and holds just the right amount of wine. I love the L-150. Just received it yesterday but all is well, except today it is on sale for $100 less. It would be even better at $100 less. i've been shopping for a new wine fridge (to replace two smaller wine fridges) for some time now. I wanted a cellar that would hold ~100 bottles, show durability, and at reasonable price point. This model hits all of the marks and has exceeded my expectations. The turnaround on fulfillment was faster than i ever expected (within a week), delivery service was prompt courteous. We've had the fridge for 2 months without a hitch - consistently holds the proper temp and has great capacity. We're pinot drinkers, so we're only able to fit ~100 bottles, but I can see how it can easily fit 150 cab sized bottles. A fantastic buy!!! I’ve only had the unit for a week, but the delivery crew did a great job getting it in and set up. It reached the set temp quickly and has held steady. The space between the slats on the shelves are not optimized for most California cabs. On some shelves, I was able to go layers of bottles alternating forwards and backwards. However, most shelves are just stacked however the bottles will fit. At some point, manufacturers will need to adjust the designs of these to better accommodate the size of today’s bottles. Also, the blue light is cool- but very bright and very blue. Really could use a dimmer feature. Bottom line is that if you want to maximize the number of bottles in the unit, it won’t look pretty. Mine is in the basement, so I really don’t care, but if you’re wanting to have this in a kitchen and/or somewhere on display (and you have bottles of quality California cab) you will want a unit that fits better or you’ll need to put significantly fewer bottles in the unit if you want it to look nice. So far, good quality, good price, great delivery. So far so good, but not good for holding as many bottles as they say notwithstanding their disclosure that if you have pinot bottles. Shelves do not move in and out very well. Overpriced for what you get. Cooler isn’t deep enough to stack nose to nose like they are in the pics. I am wishing I would have just bought one like my older one because I can store a lot more in less space. Total disappointment. We are very pleased with the wine cooler we purchased. It took longer than expected to receive it but happy now! Just received the Wine Enthusiast Classic L-150 Wine Cellar last week. Customer service with AC was excellent, and very pleased with white glove delivery. So far it's holding temp perfectly and pull out shelves are nice feature. Glass door displays wines esp. with blue lights that can be turned on/off. Have also owned a small 50 bottle Eurocave for years, but felt this would be a better unit based on price, size, and features. Looking forward to start filling it up. Looks great and keeps the wine at a consistent temp and humidity. This unit fit everything I needed. Has been easy to use and very efficient. This is perfect for us and it holds the temperature beautifully. I love the fancy blue lighting too! Great service, communication, and prompt and free white glove delivery were exceptional. The unit works wonderfully well, and is very quiet. I had an unpleasant experience with another company I had worked with, so this experience really stood out in a positive way. I am very happy with this wine cellar! Just got delivered this morning; cant turn it on for 48 hours. so far so good...looks great. Cant wait to turn on the blue LED;s and get the wine chilled. I just received the wine cooler today and let it settle into the temperature of the house after coming off the delivery truck on a cold day. I loaded it with my wine and turned it on about 3 hours later. It seems to be working fine and I'm pleased to date. Works well. Reasonably quiet. Accommodates pinot bottles but this obviously decreases the number stored. Great unit. Simple design. Good size. While it does hold fewer bottles than advertised, it does have ample space and I like the fact that it was delivered with the shelving already installed. That was something I did not expect. Also, it has an internal lighting option which is very nice as well. Overall, very good unit for the money. The wine racks bars could be better placed.They do not fit many bottles but I can fit more into the cellar than our old one which was bigger. The L-150 has so far been an overall good purchase. The delivery guy was excellent, called before delivery, arrived within the window and most important, moved the heavy unit into my basement with no problem and even helped to balance the fridge on a somewhat uneven floor. The unit is attractive, has a rather useless blue light that you can just turn off, maintains its temperature very consistently so far and has stored at least 100 bottles of my best wine. The only disappointment is the storage capacity is a little underwhelming with 150 being the capacity for strictly bordeaux claret bottles only. I've managed to jam in an assortment of burgundy, californian and riesling which leaves no room for aesthetic display, but who am I going to show off to in a dark basement anyway? So, so far, I am pleased but I think I may have to upgrade in the future to something with bigger capacity if I am going to store any more collectible wine! Nice looking cooler and it holds its temperature within a degree or 2. Extremely quiet when the compressor kicks on. I was aware it wasn’t going to hold 150 bottles and knew this going in so interested buyers considering this unit should note that. My only reason for not awarding 5 stars was that it took WEEKS to get it delivered. The cooler itself is terrific but the overall experience was dampened by the delay in getting it. This does not allow for stacking for standard bottles. Buyer beware. Unit arrived and door did not close due to missing part. We refused delivery. Hopefully they will send new unit soon, and we don’t have to end up paying extra for delivery. This is my first purchase from Wine Enthusiast and it went off without a hitch. The website was easy to use and customer service was knowledgeable and very helpful. The last mile delivery group was excellent and they set up the coolers and cleaned up without a question. I have only had it working for five days…too early to give comment.It is ,sleek,atractive : I am full of high hopes.